Spring has advanced well, I’ve been hatching alevins wherever I could. 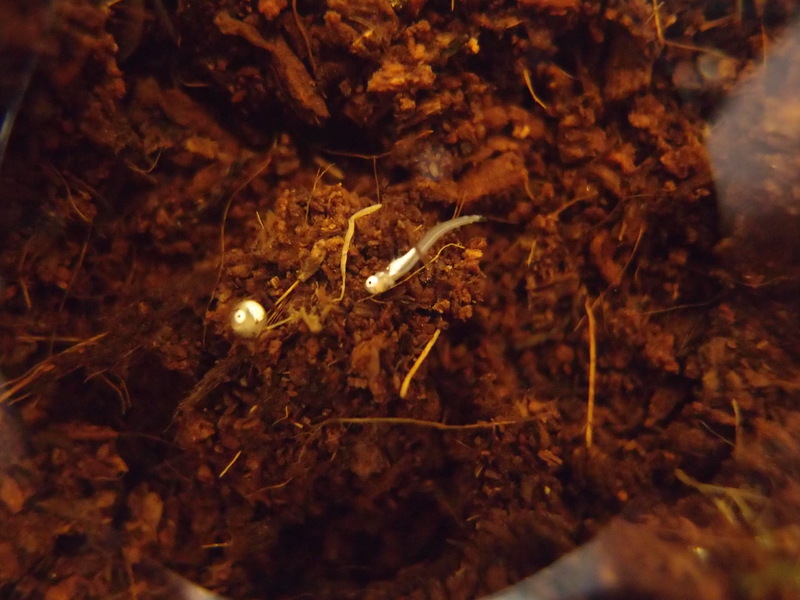 For different reasons, I wanted photographs of freshly hatched alevins. 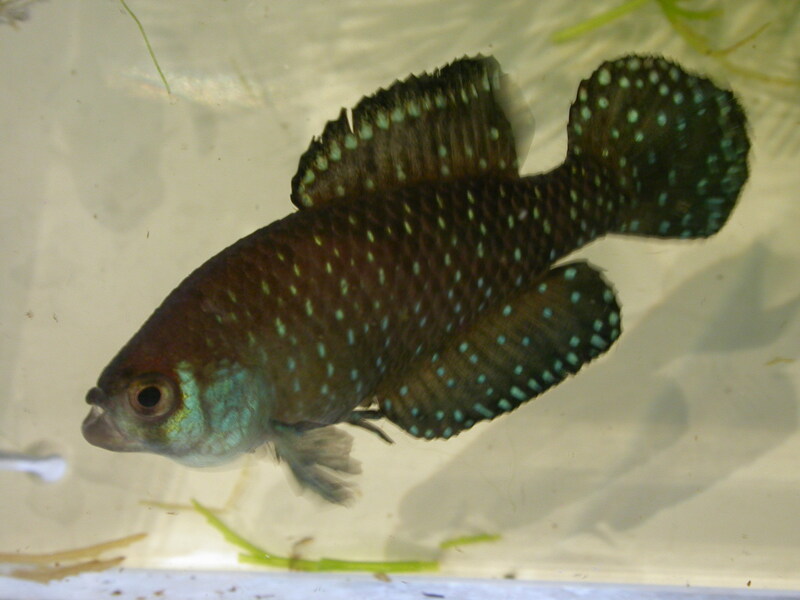 At first I always waited until they swam well after hatching. 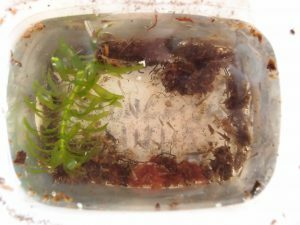 Now I found out I can just as well photograph them while still “bellysliding” and that they will start to swim well after a while if I transfer them to a very shallow tray (or with different water levels) after taking the photo. After some weeks of attempts at hatching many fry, my wooden fish house got filled up with small tanks from bottom to top. 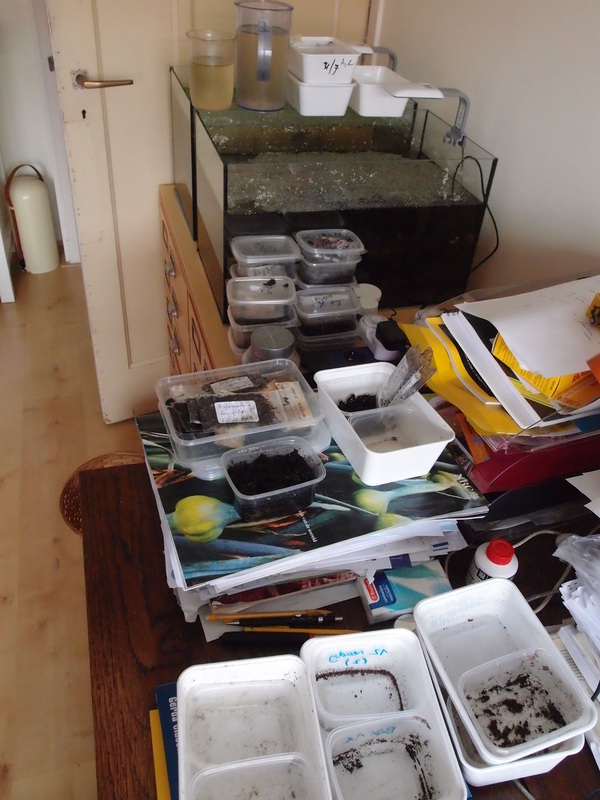 I decided to postpone further hatching for some time, until nearly all fish are outdoors and reproducing. Inside the house, there still are small groups of Austrolebias wolterstorffi (El Bagre, Canal Andreoni), prognathus (Canal Andreoni, Salamanca), elongatus (Vivorata, Villa Soriano, Gral Conesa), cheradophilus (Ruta1316), vazferreirai (R26), arachan (Chuy), gymnoventris (Castillos, Velasquez), nigripinnis (Maschwitz, San Juan Missiones), viarius (Castillos), bellotti (Maschwitz, Ezeiza), apaii (Villa Soriano), charrua (Canal Andreoni, R1316), luteoflammulatus (Canal Andreoni) and lonesome individuals of a few more species. 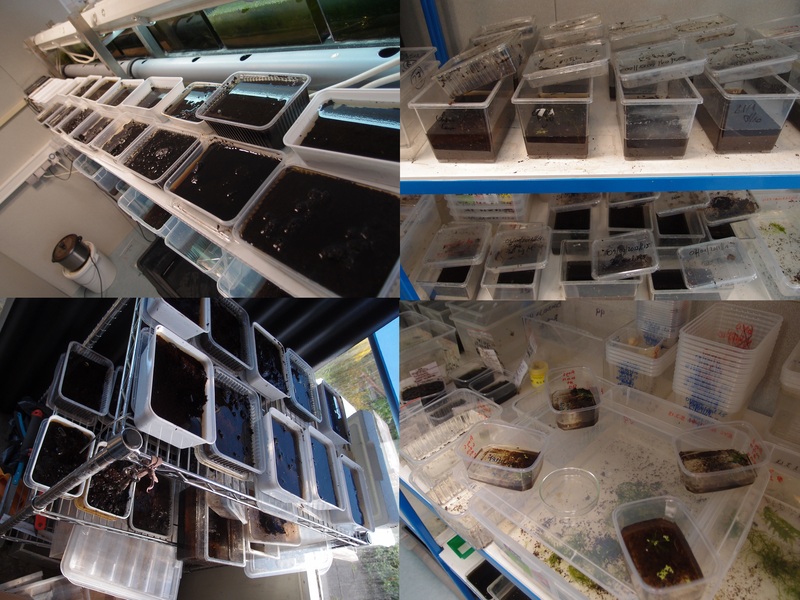 Suddenly I got fed up with transferring peat from a box/bag into a small tank, adding water, putting all peat back in a bag/box afterward. I now hatch the fry straight in the box where their peat is stored in. 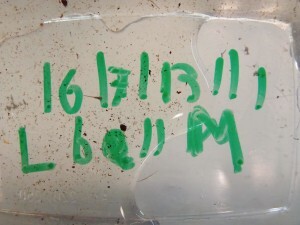 One liter or 0.5 liter plastic take-away boxes are used for storage+hatching. I buy them in a Chinese supermarket, per 50 or 100. 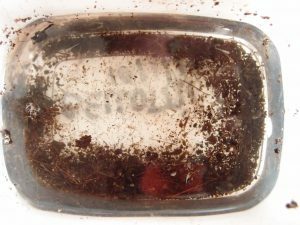 I add rainwater from a tank to the peat in the box. 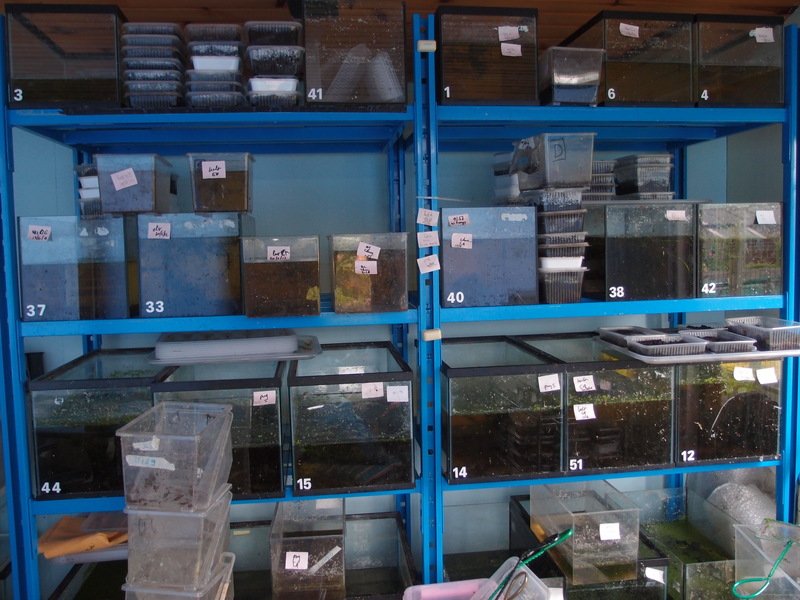 After one or two days, the fry (if there are any) are poured off into a different tank. 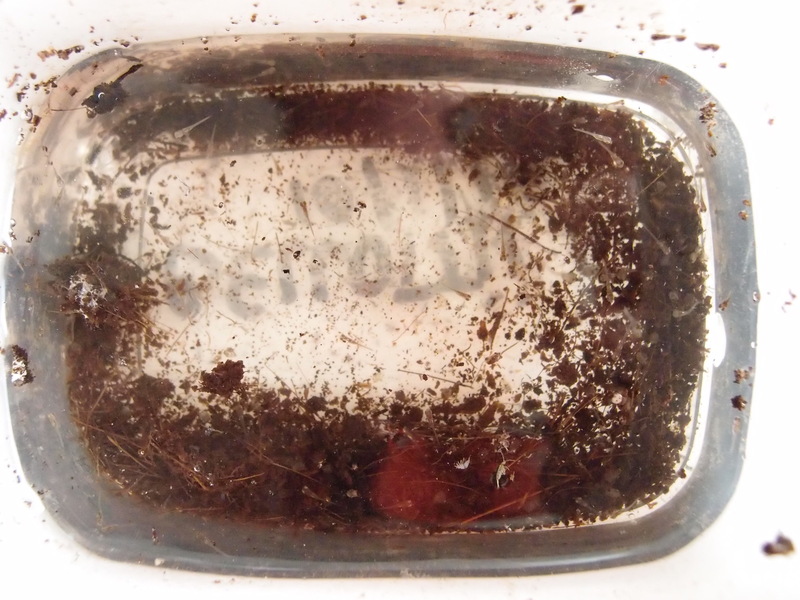 Drying the peat for the next round: I close the lid again and put the tank on its side. 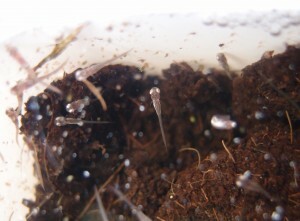 All water usually drips out soon. 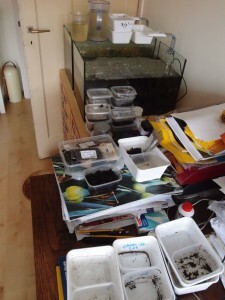 I am contemplating to construct some sort of dam-net-rake which allows me to pour of all excess water quickly. 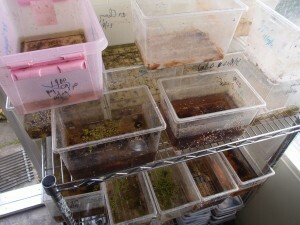 More on the experiment done in the ECOLAB. 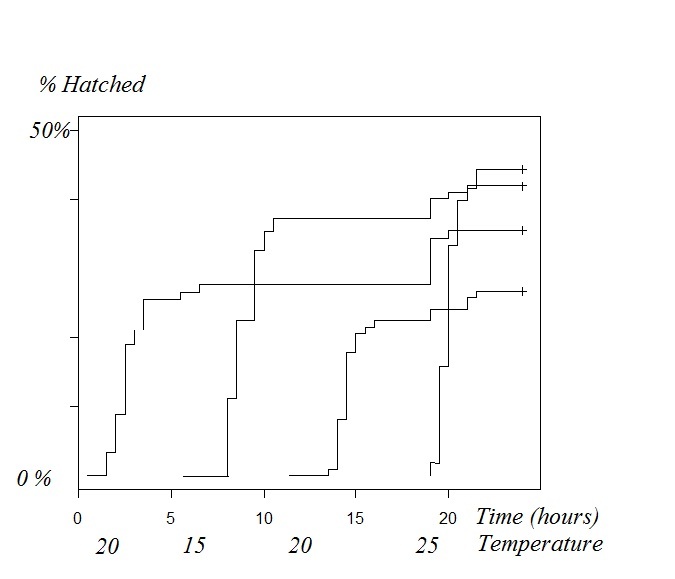 The results indicate that hatching does not depend in a simple and obvious manner on the temperature pattern. 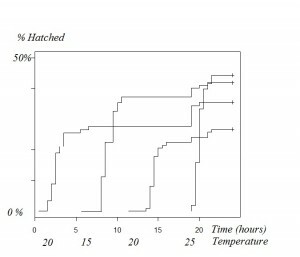 What the data do suggest is that the proportion of alevins which swim well and which are still alive after two weeks is largest, when water is added at the lowest temperature in the cycle, so that it increases steadily for 12 hours after wetting.